Scroll:Bit from the pirates of Sheffield Pimoroni is a 17 x 6 grid of ultra bright white LEDs with an adapter in to which our micro:bit can be slotted into. 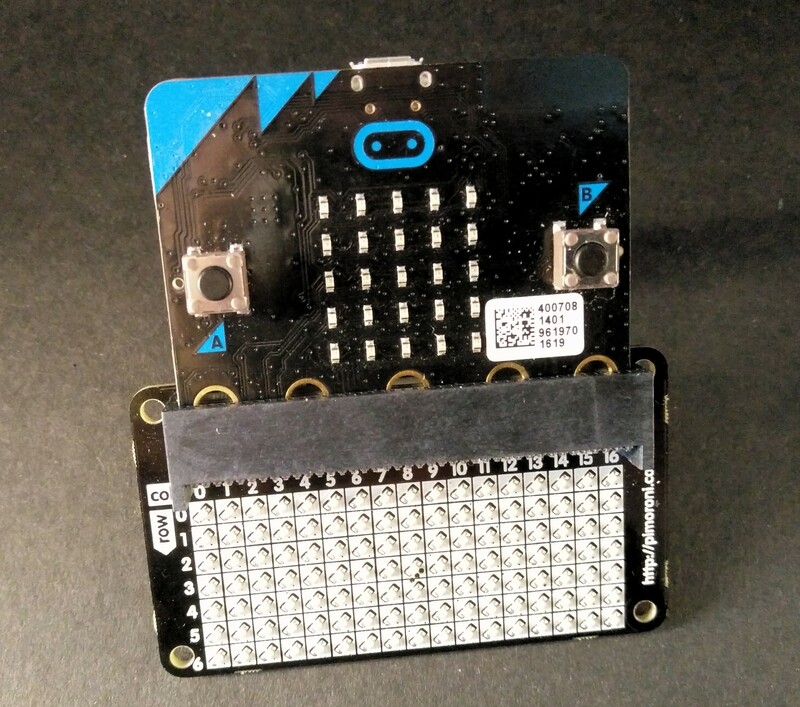 But hang on..the micro:bit has an LED 5 x 5 grid...right? True, but the 5 x 5 grid is tiny and when we want to scroll a short phrase / sentence it takes ages. With more LEDs we have more space to scroll messages. Scroll:Bit can be programmed using Micro Python with Mu but you will need to jump through a few hoops to make it work. Not too difficult but it may get frustrating for users as mistakes are easy to make. For now the best way to code the Scroll:Bit is using the PXT / Blocks editor so that is the way we shall go!. In the new dialog box search for scrollbit and when found click on the image to install. Now we can see a new Scroll:Bit menu from which we can use blocks. So lets keep it simple and go into the Scroll:bit menu and drag scroll " " at brightness 128 with delay (ms) 50 and place it inside forever. Change the text between the " " so that it something cool, fresh and funky... or just use Hello World like I did. Ok where can I get one?